Arrival makes an impassioned plea for the necessity of global cooperation while quite hilariously never straying from the perspective of its two white, American movie stars. In this year of bruising American politics, the film's emphasis on measured communication and focused listening feels transformative. Character development, big philosophical questions, and political relevance: not what you expect heading out to a creature feature, especially one with alien heptapods that look this threatening. But welcome all the same. If you want to think about intelligent life instead of blowing it up, Arrival may be the movie for you. This is, perhaps, the best-made movie in Villeneuve's filmography to date, a robust but delicate work captured in stunning, calculated detail by cinematographer Bradford Young, and guided by Adams' stellar work as Louise. [An] unshakable odyssey of sadness and hope from director Denis Villeneuve. It is a story aimed at an adult and intelligent audience featuring an adult and intelligent performance from Adams and Renner. ARRIVAL expects a lot from its audience at the same time it is giving more. Unlike most films of this ilk, it rejects the notion that life is tragic simply because it inevitably ends in death. This story embraces death, life, sickness, despair and love. A sobering sci-fi thriller about the race to communicate with intelligent alien life to avert disaster. 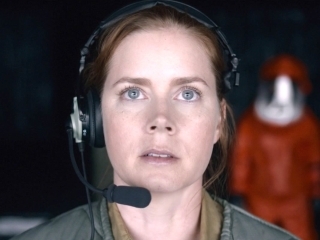 Arrival champions the importance of being able to work with and understand one another without resorting to violence, even in the face of the oft-terrifying unknown -- particularly important in today's increasingly fractured global political climate. The revelation here is Villeneuve, who expands on the symphonic pacing showcased last year in the drug war drama Sicario. Even though the concept of Arrival is far-out fiction, Villeneuve treats it with no less detail or urgency. Octopuses from outer space can't begin to compete with Klaatu or ET. Whether [Villeneuve's] forbidding worldview will strike you as an achingly realistic drama or an overly angsty downer largely depends upon what you go to movies for in the first place. The best film of the year to date, ambitious in conception and extraordinary in execution, has arrived. Amy Adams is terrific in this cerebral but enthralling sci fi drama that turns out to be much much more than just another Alien movie. "Arrival" embarrasses the current mode of contemporary cinema to explore ideas, moods and a vision that belongs uniquely to this film. Stealthy signals, unforgettable moments and Johann Johannsson's score coalesce magnificently as an iconic classic of sci-fi cinema, something to cherish for life, is created before your eyes. Its visuals are remarkable and its storyline is so beautifully structured. Arrival is one of the most extraordinary, breathtaking, and thought provoking films of the year. This is what science fiction is supposed to be. An intellect-stroking sci-fi film that asks you to imagine how humanity might respond, emotionally rather than militarily, in the event of an arrival from outer space.